The best Bergenias have leaves that turn a strong colour in Autumn. 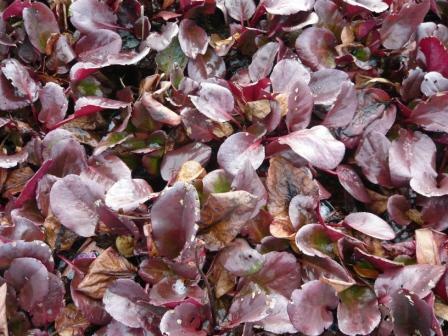 These purple leaves look good in the December garden when compared to the ‘Elephant Ear’ green varieties of Bergenia. These plants tend to be lusty and the rampant, leathery leaves may need cutting back to keep the plant in control. 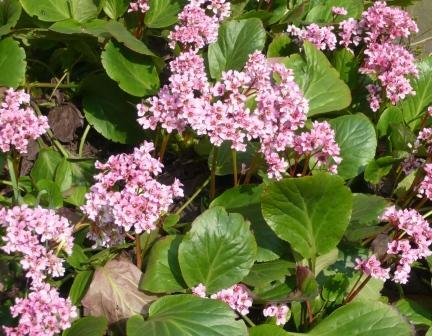 Bergenia ciliata make good ground cover plants 1 -2 foot tall depending on the variety. Bergenia cordifolia varieties have smaller leaved varieties that appeal to me for this red and purple winter leaf colouring. Cuttings from the rhizomes are easy to root and plants spread naturally in most conditions including shade. The lime green varieties may be larger leaved and more robust if you wish to cover large areas. They flower on stems of pink bells in clusters. Begenia Eroica is said to flower for longer. Dead head the flowers for a continuation of flowering. This flower is clear white but the buds are a rose pink. The rhizomes spread and the plant is useful for covering large difficult areas like scree banks. It is too large to sit well in all but the largest rockeries. 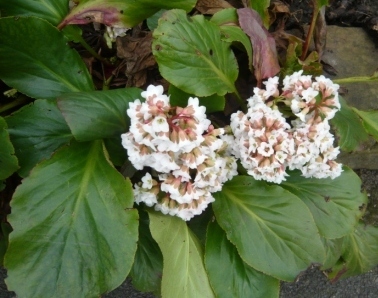 Bergenia varieties including Bressingham White, Baby Doll, Rotblum and Bergenia cordifolia are shade tolerant although better sun means better flowers. 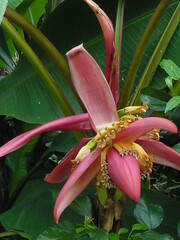 The cultivated banana comes from the genus Musa. Musa acuminata is the dessert banana and Musa balbisiana is the plantain that generally needs to be cooked. There are about 300 varieties, many of the edible varieties of which, do not produce seeds. Bananas are vegetatively propagated by means of ‘suckers’ which develop from buds on the underground rhizome. Good drainage is crucial since saturated roots will kill and bananas will not tolerate water-logging. The banana plant is a very heavy feeder. Soil should be nutrient rich, slightly acidic, and loamy enough to retain moisture and keep nutrients from leaching below the shallow roots of the plant. 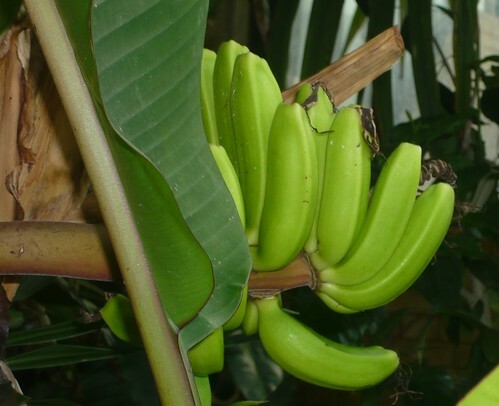 Good organic compost and seaweed will help maintain the banana plant’s high mineral requirements. A fairly well-drained soil with a high organic matter content is ideal, and plenty of water should be provided throughout the growing season. Banana plants grown under glass in this country will bear fruit, particularly under warm humid conditions. Fruit should be left on the plant until fully developed and then removed for ripening. Cutting the plant back to soil level after fruiting will encourage suckering. Bananas can also be grown successfully as foliage pot plants if the temperature and humidity are high enough. Dry air in houses is one of the main causes of leaf getting brown tips and edges. Edible bananas, such as the cultivar ‘Dwarf Cavendish’ can be grown under glass although they require a large area and plenty of height. High atmospheric humidity is essential and temperatures of at least 18°C during winter nights and 24°C during summer days are required. The plants also need full sun, possibly with some shading in the summer to maintain the requisite high levels of humidity. Musa Williams Hybrid is a banana plant grown for the large banana heads with sweet, delicious bananas from a plant only growing 6-8 feet tall. 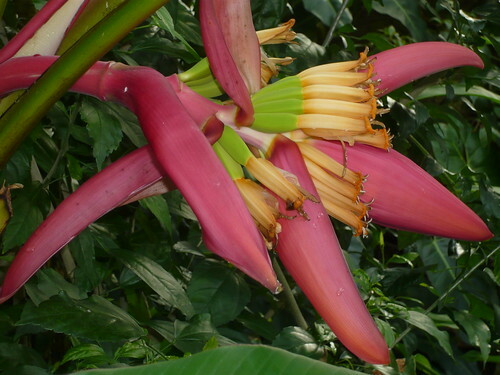 If growing for foliage it is important to shelter the banana plant from heavy winds that can tatter the foliage. Some plants look right together because the gardener planned it that way. In my case happy accidents are often the cause of plant combinations that work well. In yet other gardens it is the growing conditions that are the over riding factor that create the overall effect. 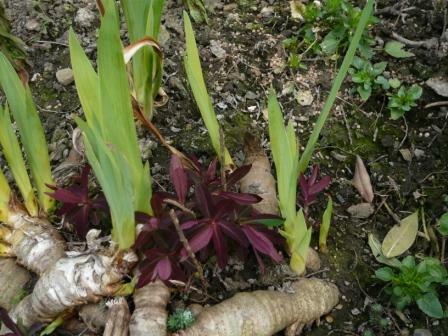 The Flag Iris above are in the process of being colonised by the small Euphorbia which spreads rapidly by creeping roots. In spring I am happy that the red shoots contrast with the lime-green, sword shaped leaves of the Iris so I plan to leave them until the Iris flower. By then the dark blue flowers will not need a red leaved under planting so they may have to come out. These Iris also need to be split as the rhizomes are old and each piece only produces one stem. I will do this splitting a few weeks after flowering and plant pieces of root and throw away the old woody center.